Being greeted at the airport in Hawaii with fresh flower lei is probably the first opportunity for many to understand just how important fresh flowers are a part of the Hawaiian culture. Flowers represent love, welcome, respect and much more in the islands. Flowers also play an official role with a different one representing each of the islands. The Big island of Hawaii is larger than all the other islands put together. 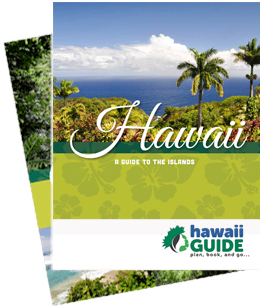 The 6,424 square miles offers a variety of elevations and terrain like no other island. From snow covered mountain summits to fiery lava flows and pristine white sand beaches, Big Island has many features that other islands do not. The ohia tree and more specifically the rich red blossoms that the tree produces thrive in all elevations. Ohia forests are thick in the upper elevations, while they can be found tended to in private gardens and resorts on lower levels. Legend says that picking a lehua blossom will make it rain. Other legends tell a story of fiery goddesses, love and loyalty. But besides all the mysticism, the lehua blossom remains as the official flower of Hawaii’s Big Island. Hawaii’s Valley Isle attracts many who enjoy the upscale resorts, glorious vistas and natural scenery. Although Maui is known for the abundance of protea farms on the slopes of Haleakala, the official flower is the Lokelani blossom. The tiny rose grows in colors from deep red to pink all year long wedged between traditional tropicals like ferns and palm trees. Not a native flower like the other islands, it seems appropriate for an island that is beloved by so many from all over the world. Oahu is the main island in the Hawaiian Island chain with a population that surpasses totals from al the other islands. Busy and bustling, Hawaii’s Gathering Place is a center of business, government and military. The official flower of Oahu is the tiny and honeydew melon colored Ilima blossom. Found on shrubs that mature to knee-high heights, the inch-wide blossoms are paper-thin and thousands are required to fashion lei that have traditionally presented to those of noble standing. Ilima is scentless, but when strung and braided, the flower lei are elegant and regal. The shrubs grow wild and require little or no attention to thrive, perfect for all those busy lifestyles on Hawaii’s second largest island. One would think that Hawaii’s Garden Island would have the most exquisite official flower. After all, the abundance of fresh water, tropical conditions and untouched beauty would be the best place in the islands for the most exotic and beautiful flowers to thrive. But, this is hardly the reality. In fact, Kauai’s is officially represented by a berry from a native citrus tree. It’s an exotic berry that can only be found on Kauai in the wet upper elevations of the inland mountains. The branches have appealing licorice-like scent that was popular with ancient Hawaii tapa makers who placed the branches in folds to delicately scent the cloth. However, the tiny mokihana berries are toxic that can cause death if eaten and serious reactions when exposed to unprotected skin.